Enjoy all-new adventures in the Star Wars universe with The Force Awakens™ Beginner Game! Set during the rule of the New Republic and just prior to the events of The Force Awakens, The Force Awakens Beginner Game contains everything three to five players need to play their parts part in the struggle between the First Order and the Resistance. With plenty of opportunities for combat, social encounters, savvy tech work, and more, the included adventure, Discovery on Jakku, teaches you the fundamentals of Star Wars roleplaying as you play! The adventure starts outside the wreckage of a New Republic corvette crashed into the surface of Jakku, and you jump right into action as members of the vicious Strus Clan demand you let them seize the wrecked corvette and all the secrets that it holds. You'll only have a few moments before everyone goes for their blasters, but that's all the time you need. The Force Awakens Beginner Game ensures that all the important game mechanics are introduced as you need them. This means that you'll be learning the system even as you play through the growing narrative. If you need a quick reference during play, simply consult the included perfect-bound rulebook, which includes everything you need to develop your own adventures. One of the joys of a roleplaying game is the opportunity to imagine yourself as another character, and The Force Awakens Beginner Game makes it easy for you to get started. Simply choose from one of four pre-generated characters, and the matching character portfolio will provide all the information you need to step into his or her skin. Will you play as a New Republic soldier, a thrill-seeking ace pilot, an Abednedo native of Jakku, or a human explorer who just happens to have a long history with the Strus Clan? 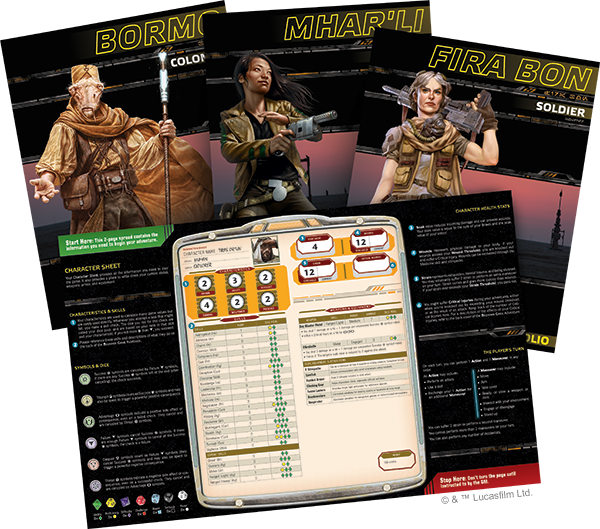 No matter which character you decide to play, your eight-page character portfolio comes with all the information you need. A background story connects your character to the adventure's opening scene and offers some hints for how you might portray your character, even while leaving you plenty of room for interpretation. Additionally, you will find brief summaries of your character's strengths and talents, accompanied by quick reference guides that cover the basics of the game's core mechanics. Finally, there's even room for growth. If you manage to get past the violence with the Strus Clan and find yourself ready to explore the larger galaxy, your character portfolio comes with options for advancing your character during Discovery on Jakku and into adventures beyond! The custom dice mechanic used in The Force Awakens Beginner Game is the same as that used in each of the Fantasy Flight Games Star Wars roleplaying games. Custom symbols for success, failure, and complications are printed directly on the dice, and every roll helps advance your story. Even a successful roll can place you under threat, and there's a chance that a failure could create some secondary advantage. This system takes all narrative conditions into account, letting players and Game Masters quickly build a dice pool for each task. 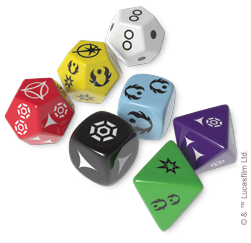 While other RPG dice systems determine success or failure as a binary state, the custom dice used in Star Wars roleplaying allow for a rich tapestry of narrative possibilities, and the ever-present potential for success with complications or failure with advantages adds a host of narrative possibilities. 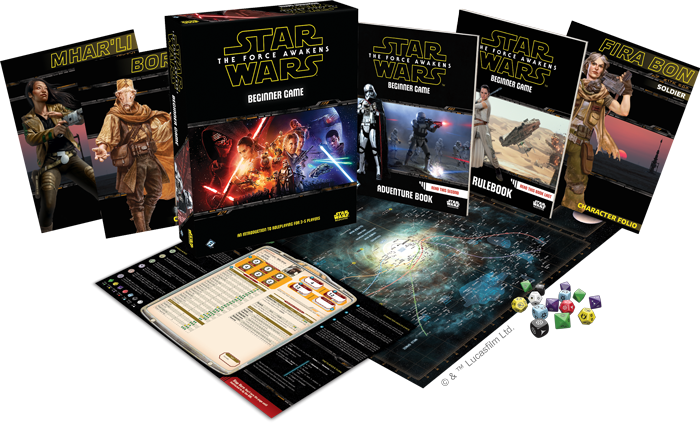 The Force Awakens Beginner Game includes all the components that up to five players need to enjoy adventures in the Star Wars galaxy. A four-page intro sheet starts new players on the path to roleplaying adventure with a brief overview and example of play. Then, the 32-page learn-as-you-play adventure book includes thorough explanations of the rest of the contents. As an additional reference, a 48-page perfect-bound rulebook presents the game’s mechanics in a convenient format. The Force Awakens Beginner Game also includes four character folios (described above) and one full-color, double-sided foldout map. One side features a map of the galaxy, while the other features not only a Star Destroyer's hangar bay, but the wreck on Jakku which the players must investigate. Using this map, along with the included forty-nine Character tokens, players will easily track their locations and relative positions during the story. Finally, fourteen custom dice and eight Destiny tokens fuel the game’s core mechanic. How Does This Product Work With the Rest of the Star Wars Roleplaying Line? The Force Awakens Beginner Game makes for an excellent first step into the Star Wars universe, whether you’re a new or veteran roleplayer. You'll find the game's core mechanics presented in a fashion that's easy to learn as you go and that serve to carry you smoothly through the adventure Discovery on Jakku. Still, these are only your first steps, and there is a whole galaxy that you can enjoy. In fact, there are so many ways to enjoy the Star Wars galaxy, that Fantasy Flight Games has created three separate systems, all of which are fully compatible, but that each pursue a different experience within the Star Wars universe. Age of Rebellion™ focuses on your service to the Rebel Alliance amid the military and diplomatic contests of the Galactic Civil War. Edge of the Empire™ features grim and gritty adventures at the fringes of the galaxy, where everyone has a past, and everybody owes somebody something. Force and Destiny™ challenges you to master your emotions and fulfill your destiny as one of the galaxy’s few remaining Force users. Players who have experience with the Beginner Game will find that each of these lines is essentially the same game presented in The Force Awakens Beginner Game, but designed to promote a different tone and to permit a wider, freer, more open exploration of the galaxy. Nothing promotes a deeper and more imaginative exploration of the Star Wars universe than the line of Star Wars roleplaying games, and there is no better way to get started than with The Force Awakens Beginner Game!